Great Abaco Island, part of the archipelago of Bahamas Out Islands, is surrounded by fantastic cays that each have unique character and activities: Green Turtle Cay, Elbow Cay, Man-o-War Cay, and Great Guana Cay. 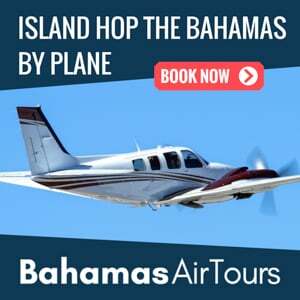 So grab your day pack for a quick hop from Florida to Abaco Bahamas for an exciting island hopping quest by plane and boat. Also known as the sailing capital of the world, Abaco Bahamas, and its surrounding cays are the perfect setting for boating adventures. 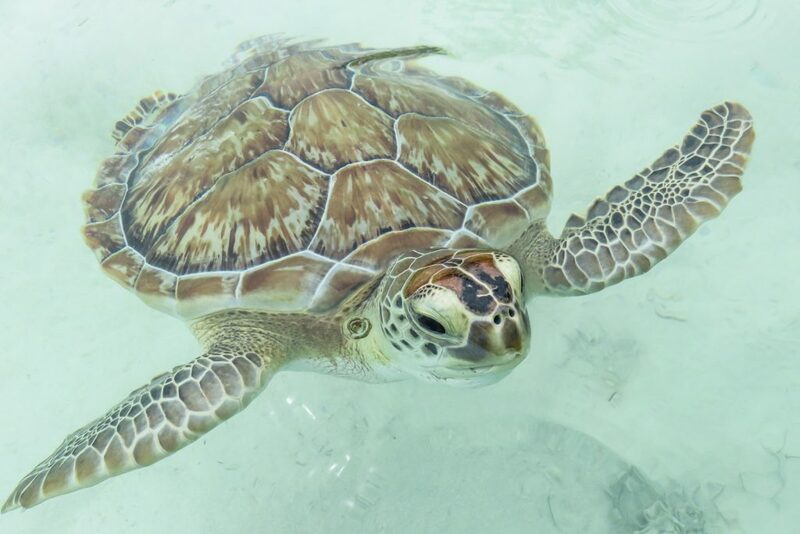 Visit Green Turtle Cay for a chance to interact with none other than green turtles, beautiful sea creatures. 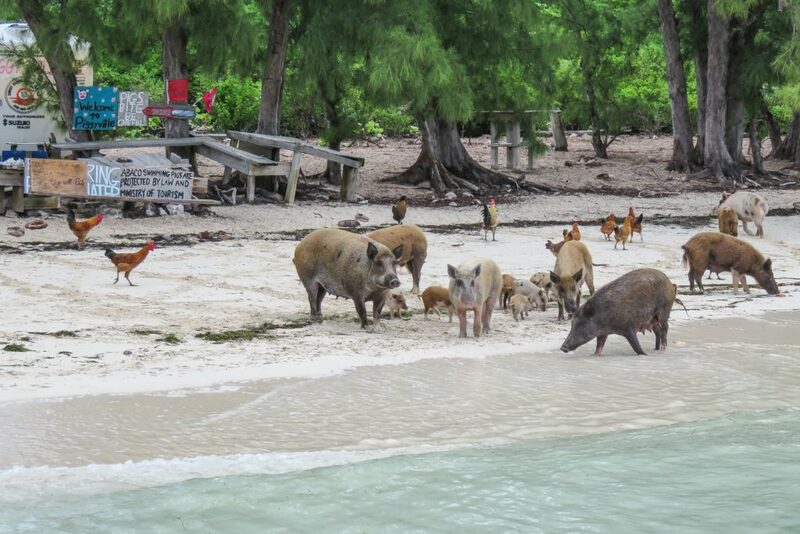 Head to No Name Island for an ocean dip with the famous swimming pigs. 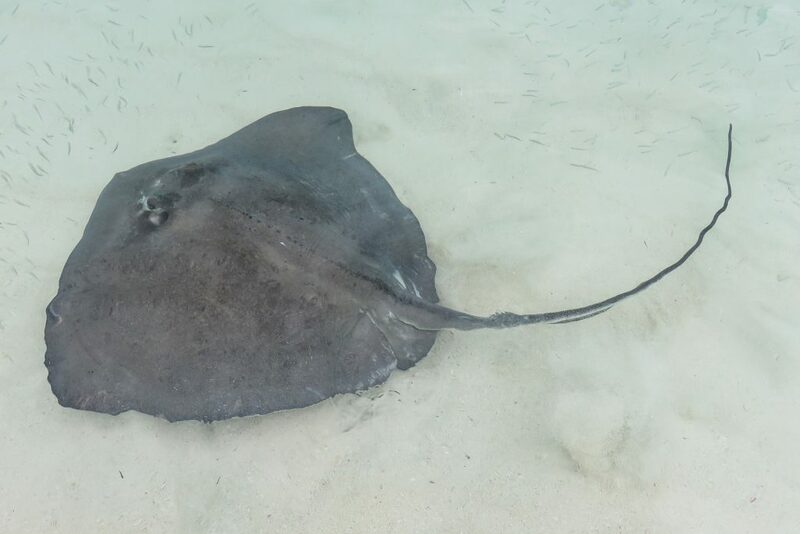 Top off your day by experiencing the graceful, mysterious stingrays. Day trips or tours of 2-4 days are waiting for you! Explore the islands, enjoy the colonial architecture, taste the flavors of the Bahamas, experience all the pleasures Abaco Bahamas has to offer. Green Turtle Cay is one of the many small tropical islands which make up the Abaco Bahamas. A cay is a low elevation island that has formed on top of a reef. Visiting this cay is just one of many isles in your island hopping adventures. 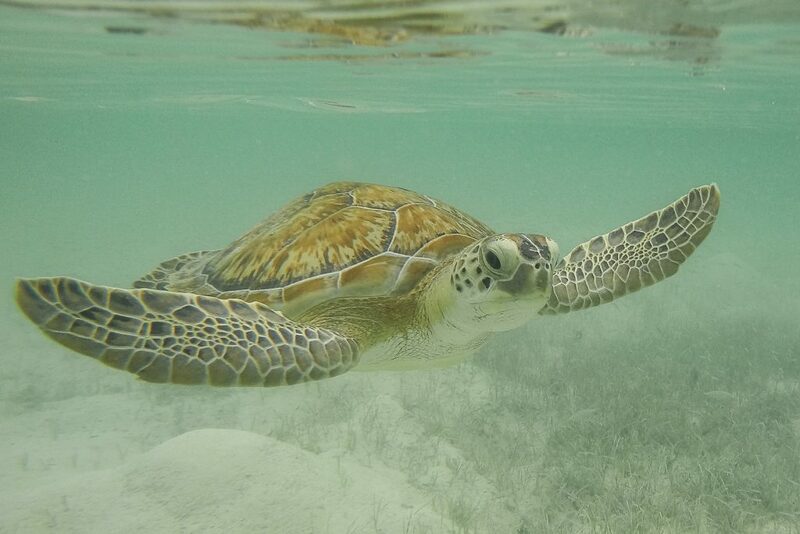 The basis for the name Green Turtle Cay is, as you guessed it, green turtles. Aside from turtles, you will notice the strong influence of British Loyalists who fled the newly formed United States back in the mid-1700’s. Many ended up on various islands now called the Bahamas due to the proximity, particularly to Florida. The signature colonial architecture in the villages speaks to its historical heritage. Green Turtle Cay is a great jumping off point for your island hopping dream vacation. The cay has a unique history, fabulous beaches, tropical cuisine, and some unique opportunities such as swimming pigs, up close encounters with green turtles and a chance to experience the graceful stingrays. 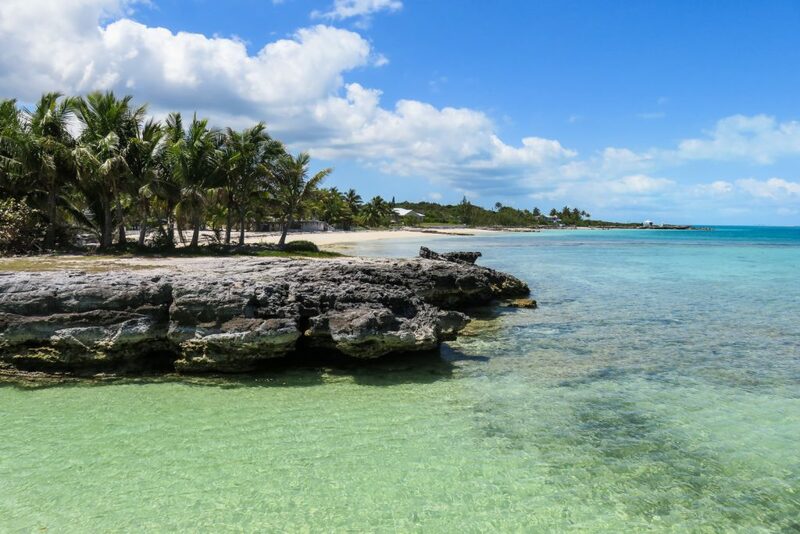 Green Turtle Cay and Abaco Bahamas is known as a locale for romantic getaways, family vacations, outdoor sports enthusiasts, destination weddings and so much more. Join us as we discover more of Green Turtle Cay and its surrounding cays. 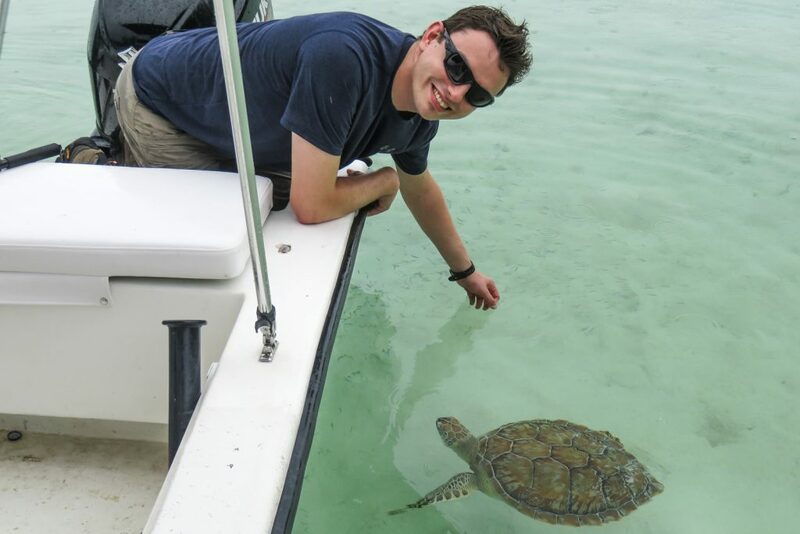 Hop on a boat from Green Turtle Cay; next stop – No Name Cay. Imagine approaching a small isle in a boat. The hypnotic crystal blue water and the sway of palm trees hold you captive. Suddenly, you see pigs approaching! 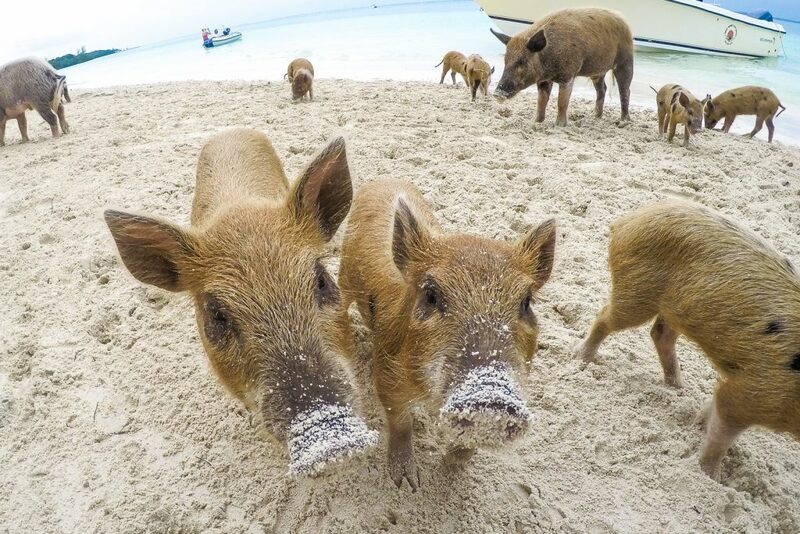 You might think pigs on a tropical island to be rather strange. It is a rare occasion. Welcome to Pig Island Bahamas Tours! 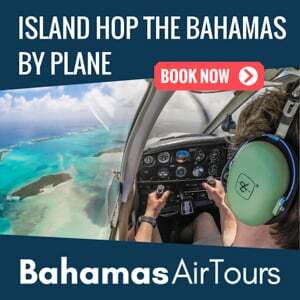 This unique adventure is one part of your fantastic day trip to Abaco Bahamas with Bahamas Air Tours. It is unclear how the pigs arrived on No Name Cay, but here they are. 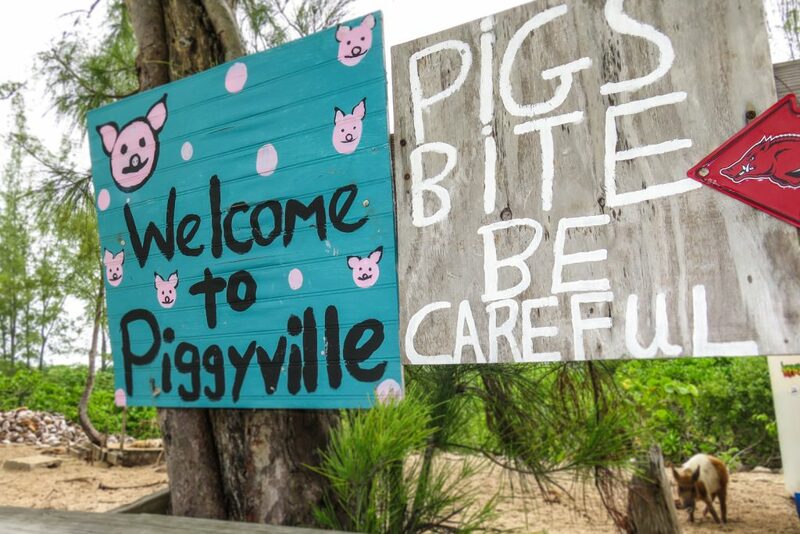 Fortunately, a Green Turtle Cay resident has taken pity on them and has managed to raise money, food and water donations to help keep the pigs alive and well. 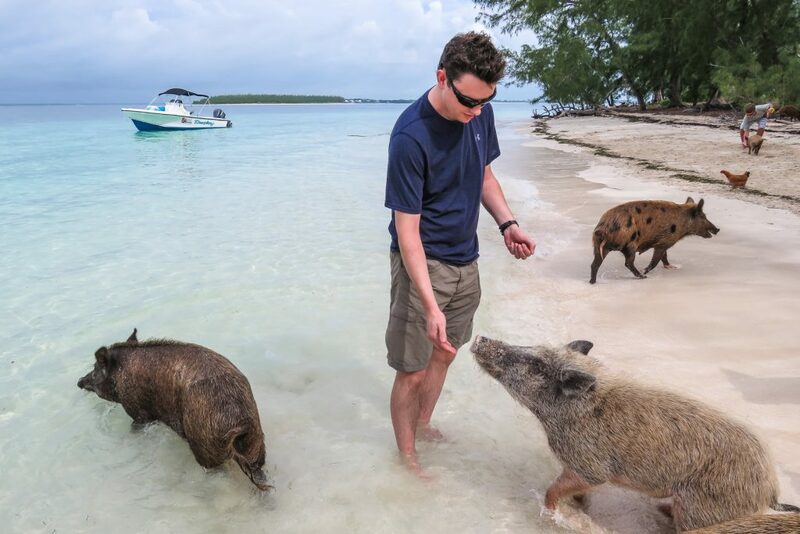 The Bahamas Pigs Tour has become quite a tourist attraction. You are encouraged to bring fruits and veggies for the pigs to eat and fresh water. One look into those big brown eyes and they will be eating right out of your hand. Hop in the water with them, and those big flat noses will nudge you for attention. 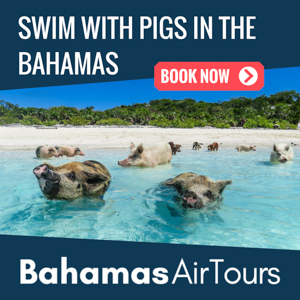 Large pigs to piglets with curly tails and soft grunts will melt your hearts as you play in the surf with the famous pigs of the Bahamas Pig Tour. 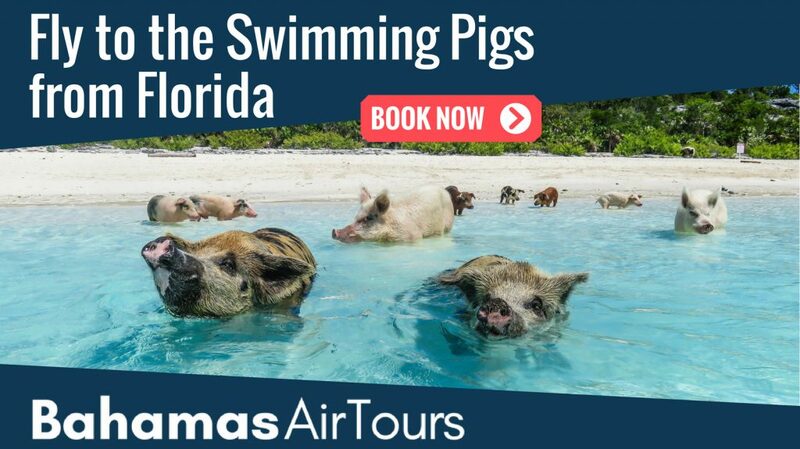 Looking for the famous Exuma Pigs? Read our Staniel Cay Article for everything you need to know about visiting the Exumas Swimming Pigs. Life on Green Turtle Cay goes beyond the shoreline. Step into the calm ocean and swim with the exotic green turtles, beautiful and graceful creatures. The green turtle is on the endangered species list. Green turtles are fun animals with mosaic coloring in yellows, greens, and browns. They are peaceful and fun to watch. Their flippers are excellent for swimming away from predators or toward food. These turtles are at Coco Bay on Great Abaco Island, just one stop on our tour of the Abaco Bahamas. 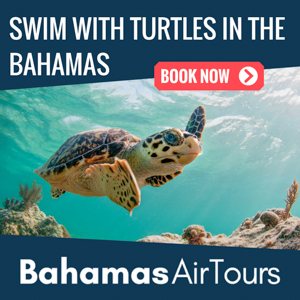 Take a boat tour to access the turtles, or if staying on Green Turtle Cay, you can drive a golf cart to Coco bay and visit the turtles without the need for a boat excursion. Either way, a visit to the turtles is an experience you do not want to miss! The stingray appears as a mystical sea creature that floats so gracefully through the water. Watching them play and flutter around your feet is exhilarating. The charcoal and white colors are stunning against the white sand and crystal water. Their skin is silky and soft. Their underside mouths seem to smile as they flirt with you. This Abaco Bahamas experience is one you will never forget! Your next island hopping stop is Elbow Cay Bahamas. The only settlement on this cay is the quaint, colonial village of Hope Town. Steeped in history that goes back to the days of Columbus and the Lucayan Indians that resided on Elbow Cay Bahamas. The history also has themes of pirates, Loyalists, wrecking from ships, ship building, sponging, and tourism. Hope Town is a history lover’s oasis. Hope Town takes pride in its historical preservation as evidenced through the fantastic Wyannie Malone Museum which is home to many artifacts of history through the ages and the local historical buildings and homes. Elbow Cay Bahamas is a quiet little island with no cars. It is small enough to walk everywhere. 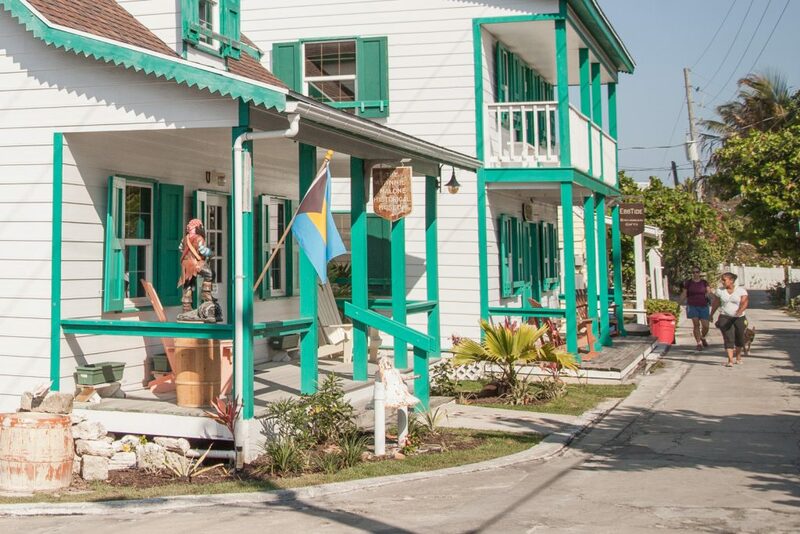 Take a walk to visit the shops, restaurants, boutiques and Hope Town Lighthouse. Enjoy the architecture and peaceful setting. If you would rather ride, golf carts are available to rent. At the end of Elbow Cay Bahamas sits a familiar landmark: Hope Town Lighthouse. The iconic bright red and white stripes of the lighthouse can be seen standing tall above Hope Town. This historic structure is still sending out its light across Abaco Bahamas just as it did over 150 years ago. The light shines a distance of 17 miles. 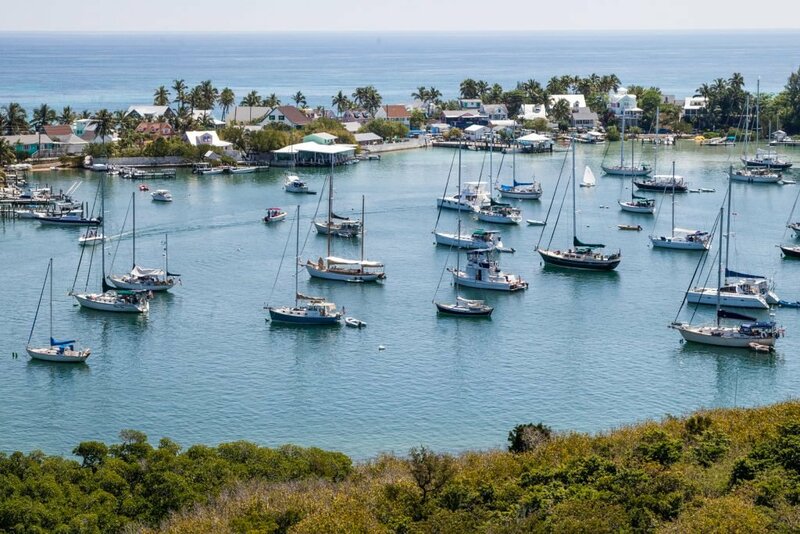 A hike to the top of the Hope Town Lighthouse will yield fabulous views of the surrounding water and cays. Let’s not forget the beaches. Every cay has fantastic beaches, and Elbow Cay Bahamas is no different. Hope Town Beach and Tahiti Beach are two such beaches. Described as heaven on earth, the beach has a backdrop of tall palm trees that sway in the breeze. The crystal clear aqua waters are perfect for wading, snorkeling, paddle boarding, kayaking and relaxing. Hope Town Beach is a great spot for beach combing for sea glass. 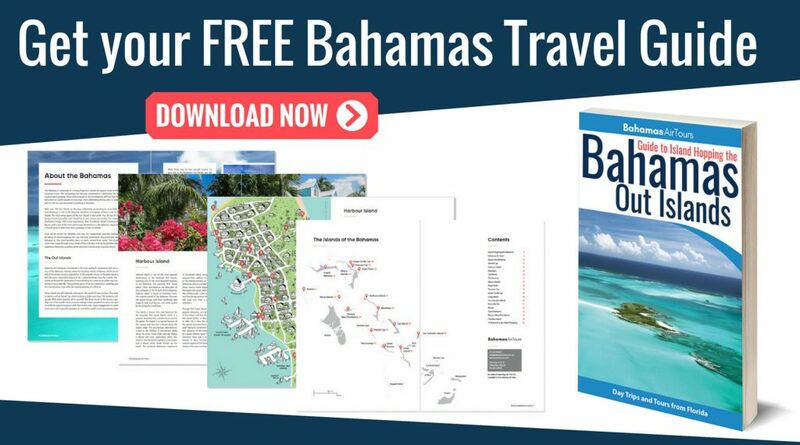 Wondering how to get to Elbow Cay Bahamas? It’s simple, hop on the Albury’s Ferry at Marsh Harbour on Great Abaco Island for a 20-minute ride to Elbow Cay Bahamas. There is daily service several times a day, and the fare is $30 round-trip. Travel between the cays of Abaco Bahamas is quite easy. Visiting the Bahamas is mostly about the beach life with a few other activities and sights thrown in for good measure. Treasure Cay has the best beach in the Abaco Bahamas. Not only that but is voted one of the top 10 beaches worldwide! 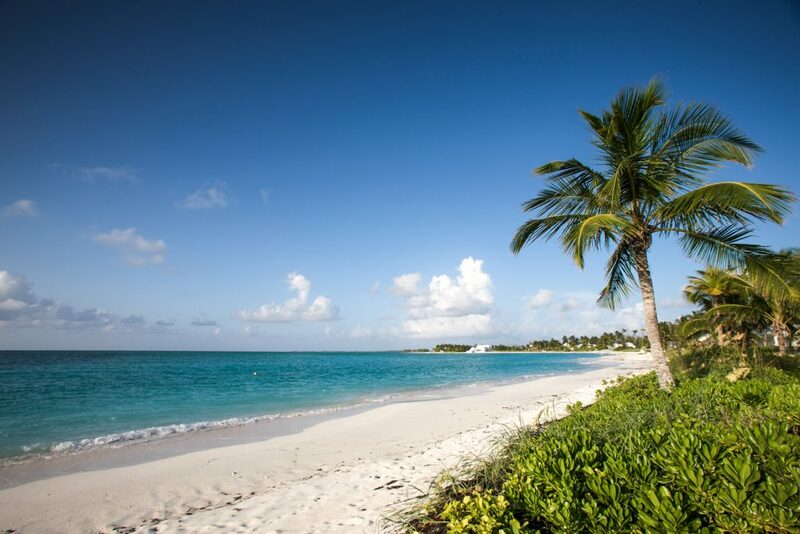 Three and a half miles of soft white sandy beach is waiting for you at Treasure Cay. 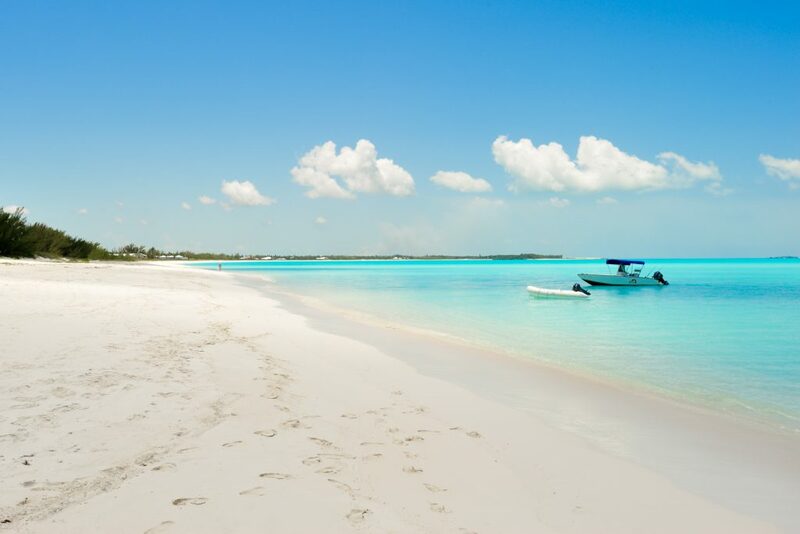 Located on the Great Abaco Island, Treasure Cay is the perfect launching pad for visiting the surrounding cays including Green Turtle Cay, No Name Cay, and Elbow Cay. Boats depart from the Green Turtle Dock adjacent to the Treasure Cay International Airport. Albury’s Ferry leaves from Marsh Harbour just a few minutes’ drive away. If you are looking for a boater’s paradise, this is it. The Treasure Cay hotels offer many amenities. For instance, Treasure Cay Beach Marina & Golf Course has services and amenities that will meet all your requirements. A large, full-service marina can accommodate you and your boat as you tour around the islands. The hotel has standard rooms, condos and private villas, all boasting beautiful views. Along with the fabulous beach, there is a stunning golf course, spectacular swimming pool and a variety of excursions waiting for you. See the concierge at the resort for details. For authentic Bahamian cuisine, try one of the restaurants located on the grounds or one of the several local establishments that offer fresh fruits and seafood. 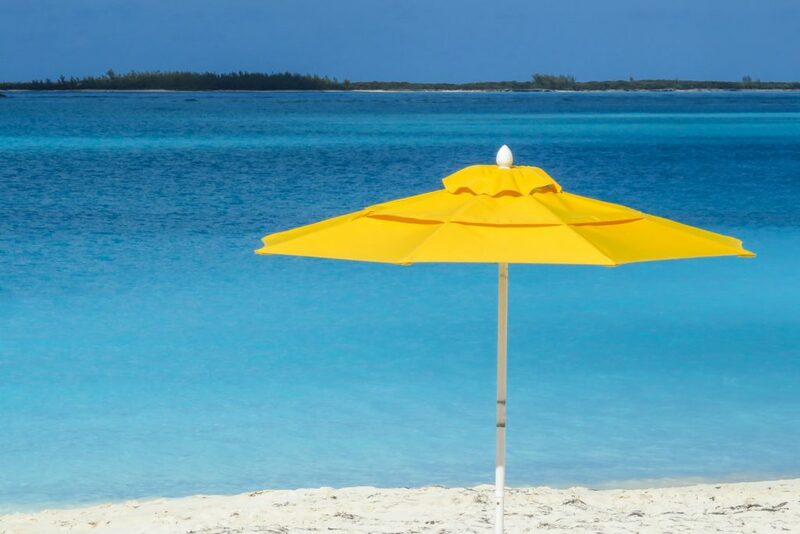 Looking for other Treasure Cay hotels? Try the Bahamas Beach Club with condo-style accommodations that can take care of the whole family having units up to five bedrooms. Other resort amenities include fantastic outdoor activities such as golf, scuba diving, snorkeling, deep sea fishing, boat rentals, kayaking, sailing, scooter and bike rentals, and water skiing. Of course, if you want to relax on the beach and enjoy the sunshine, you can do that too. Abaco Bahamas truly has something for everyone! Getting to Treasure Cay is easy. There are scheduled flights from Florida cities: Ft. Lauderdale, Miami, Orlando, and others. It is an easy one hour flight. 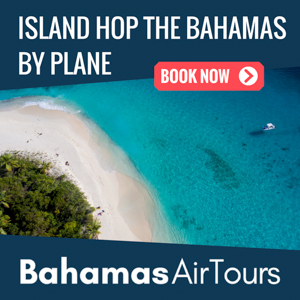 You can also schedule a charter flight with Bahamas Air Tours. Directly across the water from Treasure Cay is Great Guana Cay. Here you will find world-class boating, sailing, diving, snorkeling, and biking. The island is just 6 miles long, easy to explore on foot, by bike or golf cart. Getting to Guana Cay is easy: just take the ferry from Treasure Cay or Marsh Harbour on the Great Abaco Island. There are a variety of resorts, cottages, and suites in which to stay on Great Guana Cay. Also, there are a plenty of eating establishments and bars. One local favorite is Nippers which is more of the party bar scene. In fact, on Sundays, they have a Wild Boar Roast complete with all the fixings. It is a time to party all day and all night. This is not your typical bar: this one is right on the beach and also has two pools. Get your drink and float on the water. Chill with your friends. In 1994, the Bahamian government set aside over 20,000 acres of land on South Abaco as a conservation area to preserve the habitat and exotic animals that find their homes here in Abaco Bahamas. One such animal is the Abaco Parrot. Once very prolific, now reduced to just about 3,000 birds in all of the Bahamas, these endangered parrots are beautiful and find the Abaco Bahamas as their sanctuary. Many other birds make their home here as well. Bird watchers will enjoy watching the activities of the birds. Another great location to watch birds is the Black Sound Cay National Reserve on Green Turtle Cay. The mangrove patch is the winter home of several migratory birds including buntings and warblers. Tilloo Cay south of Elbow Cay is a nesting site for Tropic Birds, terns, yellow-crowned night heron, and a variety of other seabirds. Abaco Bahamas is truly a bird lover’s paradise. Another national park, Fowl Cays National Park, is on a strip of cay directly across from Marsh Harbour on Great Abaco Island. Established in 2012 this park hopes to preserve the coral reef, sea grass bed, and natural sandy and rocky bottom habitat. This is a fantastic region for snorkeling. Elbow Cay is home to the Byrle Patterson Memorial Garden. It is part of the Hope Town walking tour and has spectacular views overlooking the Atlantic Ocean. 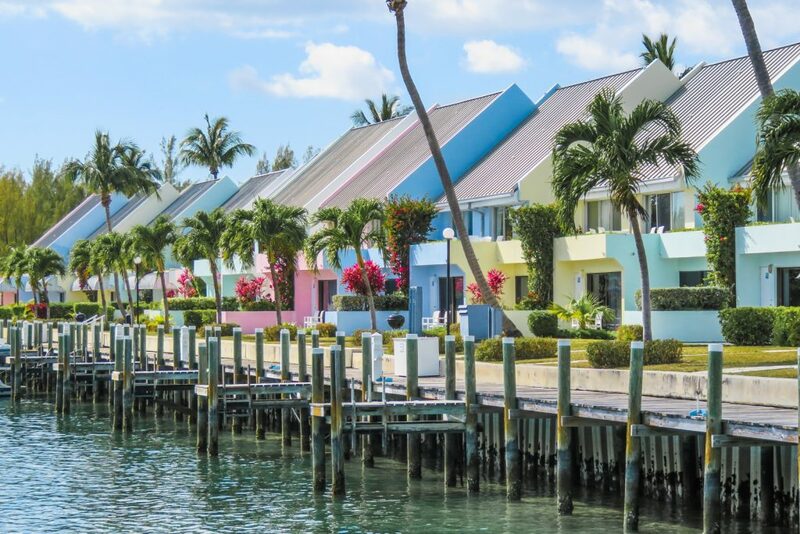 Pelican Cays Land & Sea Park is another destination to add to your list. It is home to some of the most exotic undersea life in the world. Bring your snorkel or diving gear and get ready for some fantastic views of sea creatures and plants that are a colorful addition to the surrounding area. Explore the underwater caves and reefs. Enjoy all the perspectives of this park. Remember, Abaco Bahamas has as much to see under the water as it does on top; offering great adventures for divers. Any one of these parks and reserves can are accessible by boat or ferry. The Albury’s Ferry from Marsh Harbour will take you to Green Turtle Cay. 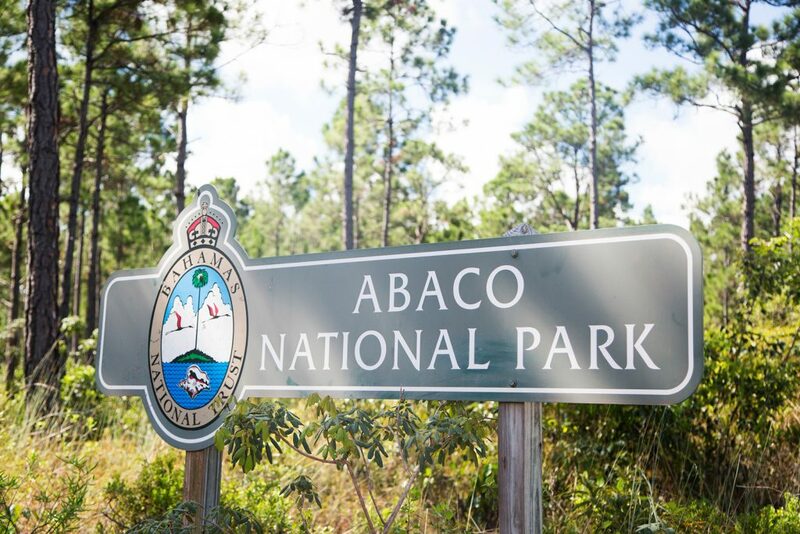 By car, you can get to the parks on Great Abaco Island. Ecotourism has taken hold in the Abaco Bahamas. You can join a hosted excursion to any of the parks and reserves as well. Abaco Bahamas is hovering over an underwater system of caves, cavities, and reefs that make for fantastic diving. A blue hole is a water filled cave or opening that has depths to the bottom of the ocean, sometimes over 200 feet deep. They get their name from the color of the water: indigo blue. Keep in mind, this type of diving is for trained, experienced divers only. If you have this certification, you will see some of the most picturesque wonders of the world. Crystals, stalagmites, and stalactites are reaching in opposite directions toward each other showing many colors of the rainbow. 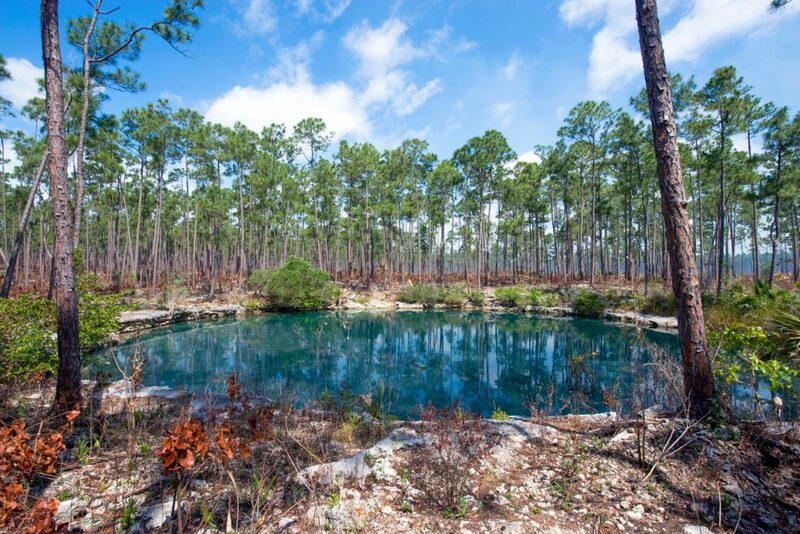 Stop in any of the local dive shops for directions to one of the several blue holes and experience the wonder under the sea. Blue Hole in the Abaco National Park. Sailboats to power boats, Abaco Bahamas is the Bahamas #1 boating destination. Your island hopping adventure has just taken on a new perspective – from the water. We have presented the glorious cays that make up the Abaco Bahamas. They can be accessed through island hopping by plane and now by boat. 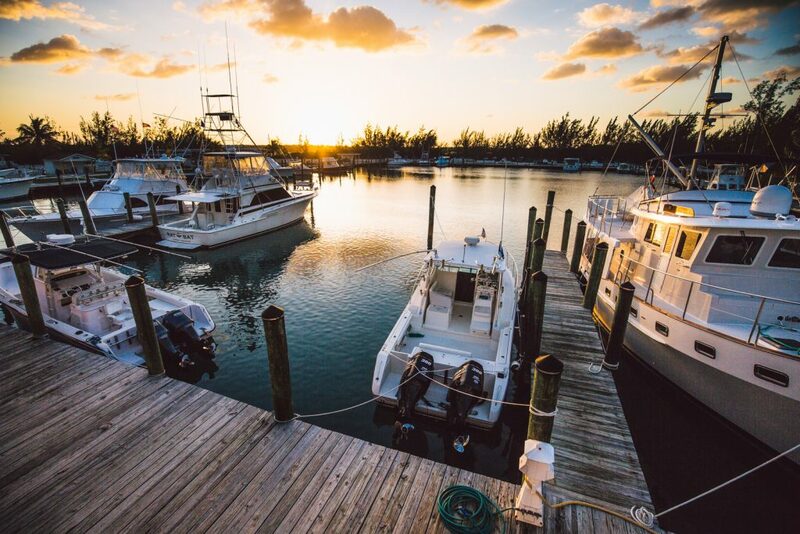 Full-service marinas are situated around the Abacos so you can find fuel or a place to tie down for the night. From your boat enjoy the full range of water sports available: diving, snorkeling, swimming, sightseeing, and don’t forget relaxing. 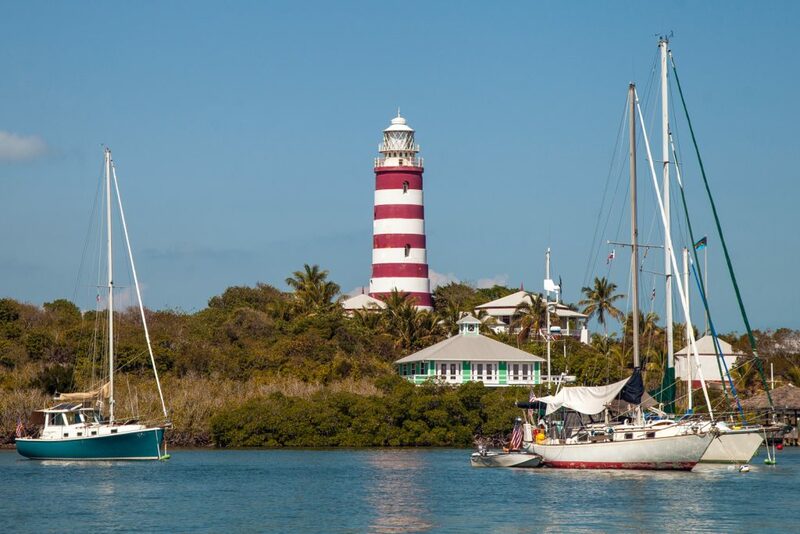 Located on Great Abaco Island, Marsh Harbour is the area’s largest town and the economic hub. It also boasts the only stoplight in all of the Bahamas Out Islands! There are resorts and hotels, shops and restaurants, marinas and an international airport. This is one of the jumping off points to explore the surrounding cays. Rent a boat, take the ferry, book an excursion, there are plenty of options for you when you visit Abaco Bahamas. 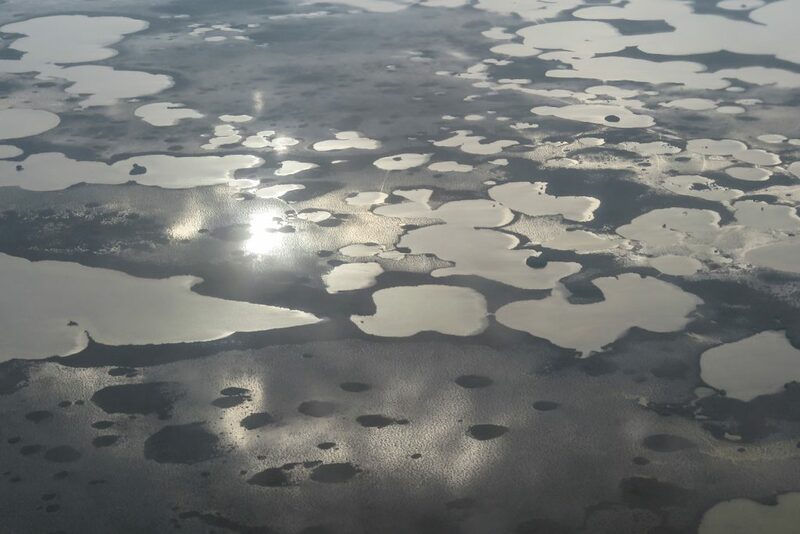 The Abaco Out Islands of the Bahamas is virtually in Florida’s back yard. If you are looking for a tropical vacation or quick weekend trip loaded with fun and adventure, visit Abaco Bahamas. Exotic animals, great beaches, fantastic cuisine, and Colonial architecture – this is the authentic Bahamas Islands experience. Feel the sun on your back, the breezes on your face, and the water lapping at your feet. Be as active or relaxed as you desire and enjoy all that Abaco Bahamas has to offer. 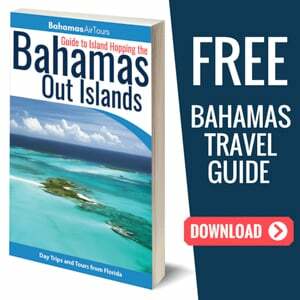 For ideas on Bahamas travel make sure to check out our Bahamas Travel Guide. Interested in booking your trip now? 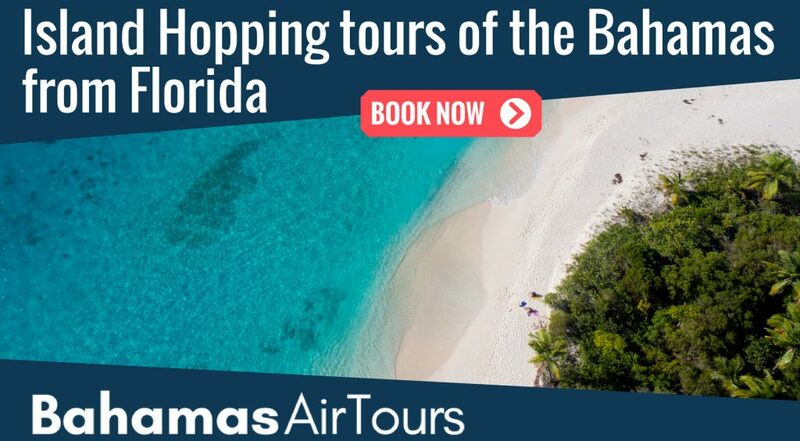 Visit Bahamas Air Tours. One thing I love about the Bahamas is its beautiful beaches…very beautiful. 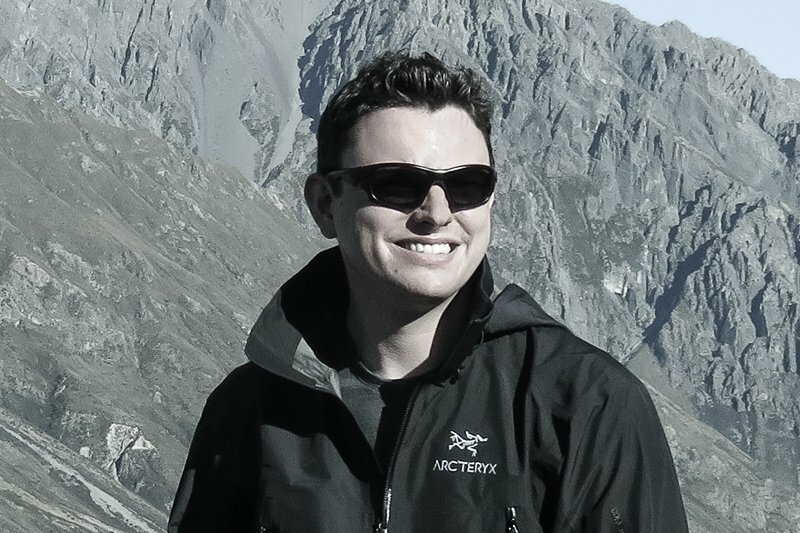 Great post Mark. Thank you for this super helpful guide! We are sailing here later this month and this was just what I was looking for!